21-story, ADA handicapped accessible glass elevator; open seasonally, connecting the Poughkeepsie waterfront and train station to the Walkway. Currently closed for maintenance. Elevator: Currently CLOSED for upgrades and maintenance. Weather permitting, the 21-story ADA-compliant elevator on the Poughkeepsie waterfront at Upper Landing Park operates from 9:00 a.m. until one hour before Park closing time. 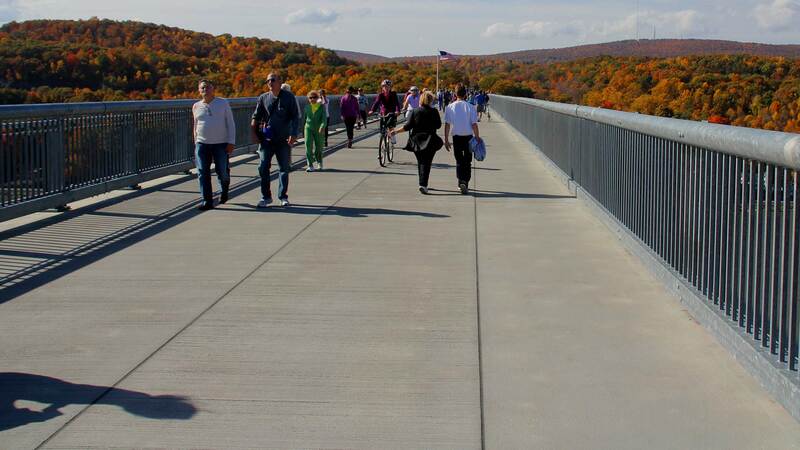 Walkway Over the Hudson State Historic Park: Weather permitting, the Walkway is open daily from 7:00 a.m. until sunset. See seasonal closing times below. During Member Moonwalks and Sunrise Strolls, the Park will open early or stay open longer; see the event calendar for dates. 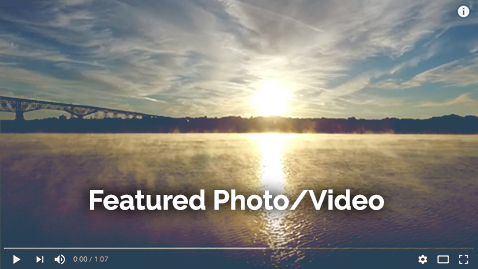 Walkway Over the Hudson nonprofit organization: Our administrative offices are open Monday-Friday, 9:00 a.m. to 5:00 p.m. Email or call us 845-454-9649. Weather closings: If inclement weather makes the Walkway unsafe for visitors, NYS Parks staff may close the Park and the Elevator until conditions improve. If the Park is closed, the Elevator is also closed. Significant weather-related closings are announced on the bridge and via Facebook and Twitter. Thank you in advance for cooperating with Park staff when they ask you to leave the bridge. Restrooms: There are restrooms and portable toilets near the parking lots at each entrance. Safety during Welcome Center construction: While our Poughkeepsie Welcome Center is under construction, lanes are compressed. Cyclists must stop, dismount and walk their bikes through the construction zone to keep the Walkway safe for all visitors. Pets on the Walkway: Your pet must be on a leash. Please take a complimentary waste bag, available at each entrance, to pick up and dispose of your pet's waste. Touch the pavement with your hand before bringing your pet on the Walkway. If it is too hot for you, it is too hot for your pet! 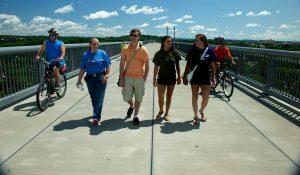 Smoking Policy: Walkway Over the Hudson State Historic Park is a non-smoking park. Other Park questions: To book an event on the Walkway and for all other questions about Park hours, closings or events, call the NYS Parks office at 845-834-2867.